The Basilica of the National Shrine of the Immaculate Conception in Washington, DC, is the largest Roman Catholic church in North America and is among the ten largest churches in the world. Designated by the United States Conference of Catholic Bishops as a National Sanctuary of Prayer and Pilgrimage, the Basilica is our nation’s preeminent Marian shrine, dedicated to the patroness of the United States, the Blessed Virgin Mary under her title of the Immaculate Conception. The Trinity Dome is the central and largest dome of the National Shrine. 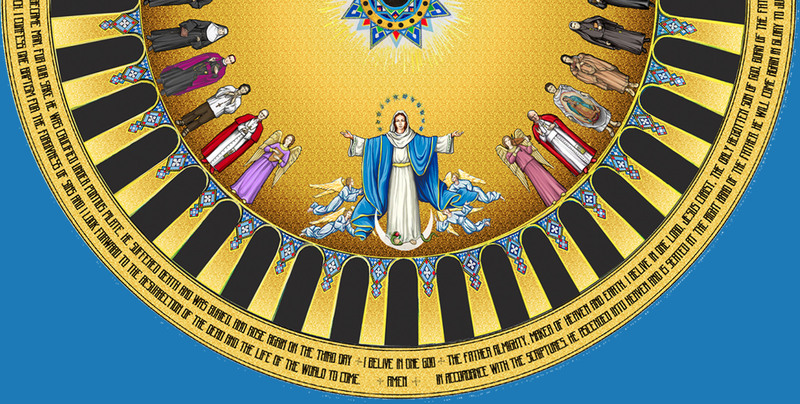 The mosaic that will adorn the dome will depict The Most Holy Trinity, the Blessed Virgin Mary, and a procession of saints, all of whom have an association with the United States and the National Shrine. Through your participation in this project you become part of the fabric of Mary’s Shrine and help bring to completion your church: The Basilica of The National Shrine of the Immaculate Conception. The Basilica of the National Shrine of the Immaculate Conception exists today because of the generosity of American Catholics, the prayers of the faithful, and the hard work of the artisans and laborers who built it. This work, which began nearly 100 years ago by our ancestors, reflects the diversity of cultures and ethnicities represented throughout the United States, while also exemplifying the unity and universality of the Catholic Church in America. This is why the Basilica is affectionately referred to as America’s Catholic Church. The Basilica of the National Shrine of the Immaculate Conception is the nation's preeminent Marian Shrine. It features over 80 chapels that relate to the peoples, cultures and traditions of the Catholic heritage in America. The Basilica is indeed America's Catholic church. The timeline below features historical video and beautiful imagery that highlights key moments throughout the history of the National Shrine.